Well, wouldn’t you know that my first assignment in a restaurant kitchen was to make three different soufflés? For about 200 people over two dinner seatings…on NEW YEAR’S EVE! Um, ok. In a nutshell, I was supposed to have three different bases ready to mix soufflés to order. No big deal, except that I had to mix and bake them in a shared oven (so much for keeping the oven door closed) and time them perfectly so that they were baked, plated, garnished and ready for waiters to whisk them to the guest’s table at just the right time, after the dinner dishes were cleared, but not too soon so that after-dinner drinks could be offered and delivered, and before they fell. This is where my irrationally confident mojo kicks in. Instead of having a total and complete nervous breakdown, I am ready to go, cool as a cucumber. I got this. As I’m standing there armed with a million whisks and my bases and meringue ready to go, Naughty Waiter walks past and violates every sanitation law in the books by dipping his pinky into my enormous bowl of fluffy meringue (this is why I call him Naughty Waiter) for a taste. Naughty Waiter: Wow, that is REALLY salty! ME: What the–(pushing rage aside) wait, what? So much for I got this. What I got was 10 pounds of salt that Chef unknowingly whipped into the egg whites. It was ten minutes to service and I had to start all over. Confidence blown. Mojo had left the building. In the end, I pulled it off. I lost count of how many soufflés I made that evening, but they all made it to the tables on time and delicious. Not one fell prematurely. I got nauseous just thinking about soufflés for about six months after that night and I still get nervous around large quantities of sugar and salt positioned too closely together, but I can make a soufflé with my eyes closed. I am tough (you should see me with my knife). Soufflés are not and here’s the proof. Generously butter four six-ounce ramekins and place on a baking sheet. Melt chocolate and two tablespoons butter together in a small saucepan over low heat, stirring constantly until chocolate is melted and smooth. Remove from heat and let cool for 10 minutes. Whip egg whites to soft peaks in a stand mixer or by hand. Gradually add the sugar to the egg whites and continue whipping until whites are at stiff peaks. Gently add the chocolate to the remaining egg whites, folding carefully until fully incorporated and mixture is uniformly brown with no white streaks. Bake 17 — 20 minutes until souffles are puffy but still jiggle slightly when the baking sheet is gently nudged. 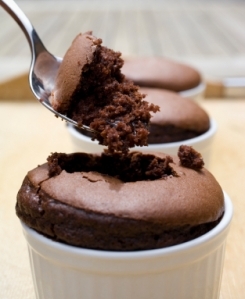 Remove the souffles from the oven and immediately place each ramekin on a small plate topped with a napkin or doily to keep the ramekin from moving while in transit.